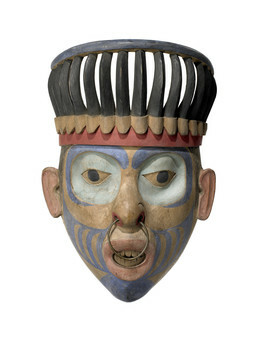 The mask depicts a singing shaman who wears a nose ring, face paint, and crown of mountain goat horns. Haida shamans, both men and women, sought to cure sickness by extracting disease-causing spirits or objects from their patients’ bodies. Sometimes a cure required that they capture and restore a person’s wandering soul.